Sunday is Waffle Day, so named by Haley as a toddler, many years ago; Kelly leaves us for her long run and I make waffles. The genesis of waffle day actually is a couple of decades ago, when Kelly, Scott, and I would devour a whole batch ourselves, after running 20+ miles every Ithaca Saturday morning. And pretty much not do a whole heckuva lot the rest of the day. Which is what summer Saturdays should be about. I just recently purchased a new waffle iron, which is pretty much the same product as the one we received for a wedding gift 21 years ago. The label changed from GE to Black and Decker, and the nonstick surface seems to be better, but it’s the same product. The other night, in the waiting area of SFO Gate 24, I was conversing about the different aspects of product marketing with a coworker and someone I’d just met. This waffle iron is the perfect example of a product that was good when it came out a lifetime ago and is still the best one out there to feed a family of five. The development costs were bought and paid for eons ago. The marketing department changes the pictures on the box every now and then. And its boxy look fits in the “functional” category (about as retro as a 70s kitchen, whatever that may mean to you). B&D/GE has a great distribution channel. The whims of the marketplace don’t batter (yeah, punny, punny) this product as much as other more fashion-oriented products. Which brings me to Kingsolver’s essays in “Small Wonder”. She has an essay about food and the ridiculous balance of energy that’s captured within, in that we expend orders of magnitude more calories in bringing a food to the table than we gain in its nutritional value. A typical food item travels 1300 miles to make it to our table. For the eggs that I use in my waffles that is carried, by gentle hand, oh, maybe 75 feet, there’s the juxtaposed bottle of French wine in the kitchen. Or bag of flour milled in Minneapolis, organic though it may be. I think we’re better than most (and yes, it’s better to buy locally) in that we’re close to Big City Produce, a small market that carries locally grown fruit and vegetables; the upscale (is that the code word these days for “yuppified”) natural foods stores (Whole Foods, Wild Oats, New Seasons) will carry some locally-grown produce, but not a lot. Thank goodness for Sauvie Island and the fact that the Willamette and Columbia River valleys produce wonderful wines. Heck, for that matter, Francois next door has the wine thing down and has a passable Pinot Noir, perfect for sipping while enjoying a summer evening sitting around the firepit in either of our backyards. Speaking of summer evening, here are some photos of the morning after last night’s crab spider/honeybee episode. 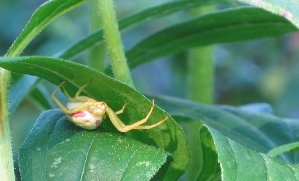 The crab spider appears to be fully sated and has retreated to the depths of the leaves of a nearby echinacea. The lifeless, and I presume, hollowed out, bee is still on the flower, where it once had the intentions of picking up a little pollen (at the corner store…) and taking it home to feed the babes.